We are not claiming these tools belonged to Queequeg (Captain Ahab’s native harpooner) but he did use similar items. This harpoon is a high quality tool... the “Cadillac’s” of harpoons were constructed with brass heads. It’s impossible to date accurately; however, similar types were used during the late 1800rds and early 1900s. This is a smaller “Iron”... probably was used for smaller whales species...it is hand-forged steel and brass. The wooden peg breaks when back pressure is applied thus swiveling the head making almost impossible to dislodge from the whale. This French telescope, again is from the early 1900s. At that time, the French were the acknowledged leaders in telescope manufacture. 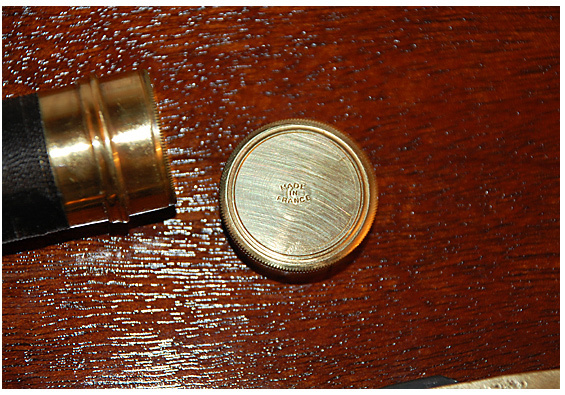 We completely disassembled it, cleaned the lens, buffed the brass and sealed it with brass lacquer. It can be easliy removed from the plaque and works like the day it was made. The Ivory scrim is dated 1945 from Adak, Kiska, Aleutian Islands. We believe the original scrim was carved from a walrus tusk and then the owner “Lamby Jim” added the rest of the writing. The solid mahogany board was sealed with four coats of spar varnish. Size: The plaque measures 26 1/2 “ long and 9” high the board is 1” thick. 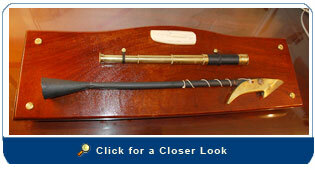 The harpoon is 22” long, the telescope is 14” long and the scrim is 4 1/12” long and an 1 ½” wide and 1 ¼ “ deep. Solid brass mounting hardware is included.